Provides maximum strengthening with hydrolysed wheat protein and calcium for harder, longer, stronger, natural nails. Strength is beauty and OPI delivers strength with its range of Nail Envy natural nail strengtheners. OPI has developed a different formula to meet your individual needs. Application is simple. Apply two coats to your bare nail and then apply one coat every other day to maintain your treatment. You can also use Nail Envy over lacquer so there are no excuses for not getting nails to envy! 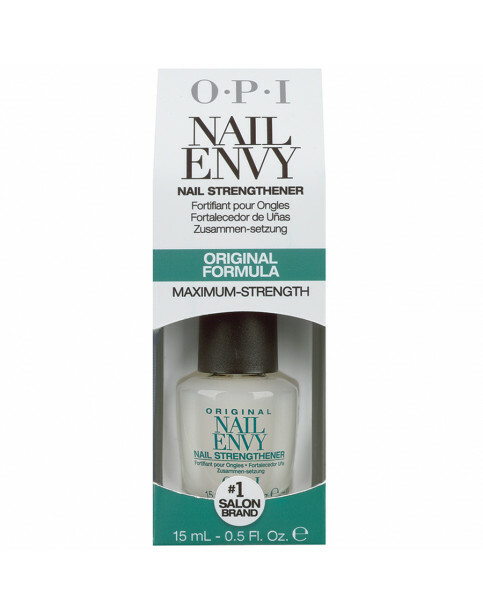 Nail Envy Original Formula is rated 5.0 out of 5 by 23. Rated 5 out of 5 by Cruella from Good quality item, repaired nails as stated After trying several similar products, I bought this on recommendation from my nail technician, as my nails were badly broken and generally in a very poor state. Within a few weeks my nails were back to normal. An excellent product would recommend this to anyone with a similar problem. Rated 5 out of 5 by Nic5 from Excellent product I recently decided to stop biting my nails and wanted a decent nail base. Friends recommended OPI as a brand and I’m so glad they did as I love using Nail Envy. It goes on easily and dries quickly. Although it looks cloudy in the bottle, it dries clear and gives my nails a lovely shape, meaning they last longer and are less likely to curl up at the edges. So far all the OPI products I have bought have been excellent. I will definitely repurchase this in future! Rated 5 out of 5 by Smiley from This has given me Strong healthy long nails This is THE best nail strengthener. It has transformed my nails after years of acrylics. I have used this for years now. It is always my base coat and now and again I use it just on its own as a real intensive treatment for a week. The coloured versions are a good option for doing this. What’s really good is that it doesn’t make nails hard as other products but really strengthens and nourishes them. Another OPI product I wouldn’t be without. Rated 5 out of 5 by Alyesha from Amazing! I’ve been using his product for 4 weeks now and it has absolutely transformed my nails! My nails are very weak and snap or peel when they get any length. My nails are now healthy and strong, I will continue using and I wish I’d have bought this years ago! Rated 5 out of 5 by Miss Marple from Excellent Product My nails were in a sorry state and after trying several products without success my hairdresser suggested I try Nail Envy Original. I am so pleased she did, my nails have improved quite considerably and are now stronger and healthier looking. Rated 5 out of 5 by DJL1963 from Brilliant results This is the second time I have brought nail envy, I had always had weak nails, using this product they are now long, strong and I am proud of my hands and nails now. A great product that I will continue to use. Rated 5 out of 5 by Helzbelz88 from Love this stuff - I now have nails!!! This stuff is amazing. My nails were weak, broken and peeling. No more with Nail Envy original - I actually have fingernails that I can drum on the desk!!! ;-D A tad expensive but definitely worth it! !